The world’s first grid-scale pumped heat energy storage system is now up and running at Newcastle University, the Energy Technologies Institute (ETI) has announced. The ETI said the ground-breaking technology could offer a low-cost method of storing large volumes of excess renewable electricity. The system consists of two containers – a cold store and a hot store – filled with gravel and an inert gas. 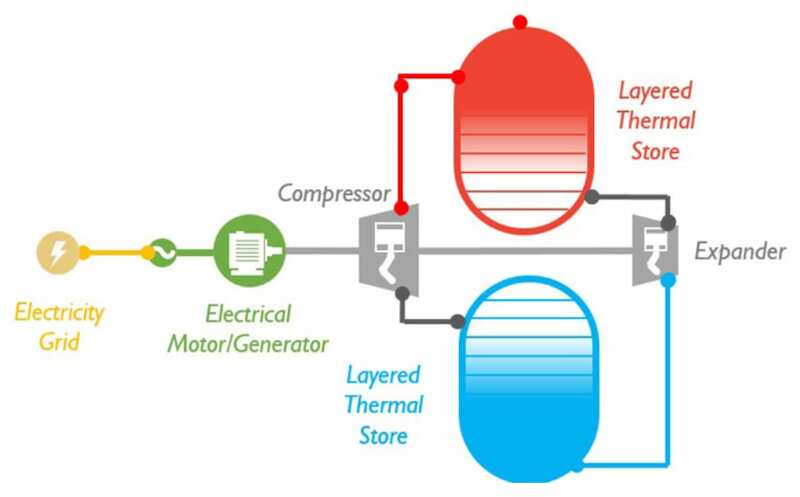 They are connected via a reversible heat pump/engine. When surplus energy needs to be stored, gas is withdrawn from the cold store and compressed using an electrically-powered pump, thereby raising its temperature. The gas is injected into the hot store where the heat is transferred to the gravel. It is then withdrawn from the hot store, expanded to further lower its temperature and returned to the cold store. To recover the stored energy, the process is reversed. Gas from the cold store is compressed and injected back into the hot store, where it is reheated by the gravel. The gas is then expanded to drive the engine, before being returned to the cold store once again. The system has been installed at the Sir Joseph Swan Centre for Energy Research at Newcastle University. It has a maximum power output of 150kW and a storage capacity of 600kWh. “Given the thermal power cycle’s enormous potential, there has been a tremendous amount of research and commercial interest in PHES technology over the last ten years,” said Swan Centre director Tony Roskilly. “However, until now nobody has managed to get as far as to demonstrate a real-world working system. Andrew Smallbone, co-director of Newcastle University’s National Facility for Pumped Heat Energy Storage, said the initial tests of the system have been very promising: “We can very quickly change our system control from charge to discharge in a few milliseconds. Smallbone said the facility’s research indicates the technology could provide one of the “lowest cost and most flexible” forms of grid-scale energy storage. He said the initial tests also indicate there is plenty of room to improve the system’s performance by tweaking its design and enhancing its operation. “This will now continue over the next few months,” he added. Last year, Highview Power opened the world’s first grid-scale liquid air energy storage system near Manchester.